One of the nicer things about the OCAG Spring “Open Studio tour” (which is to say that a lot of folks are scheduled to tromp in and out and through and around your house for two days) is that I can paint/draw whatever I please, without worrying over whether the piece will earn its keep while it hangs on some wall for which the gallery owners pay rent (and that’s not intended as a criticism of gallery owners; they have to run a BUSINESS, pay rent, etcetera). So, I get to draw what I want just now….quite as I did in the early years when my primary (and first) public-display “gallery” was the ladies’ bathroom and back hallway of Suman’s Indian Restaurant in Dear & Dirty Olde Durham. God knows that the police (let alone the self-appointed, Political-Correctness police) were scarcely in evidence back in those days, in 1990 or so. 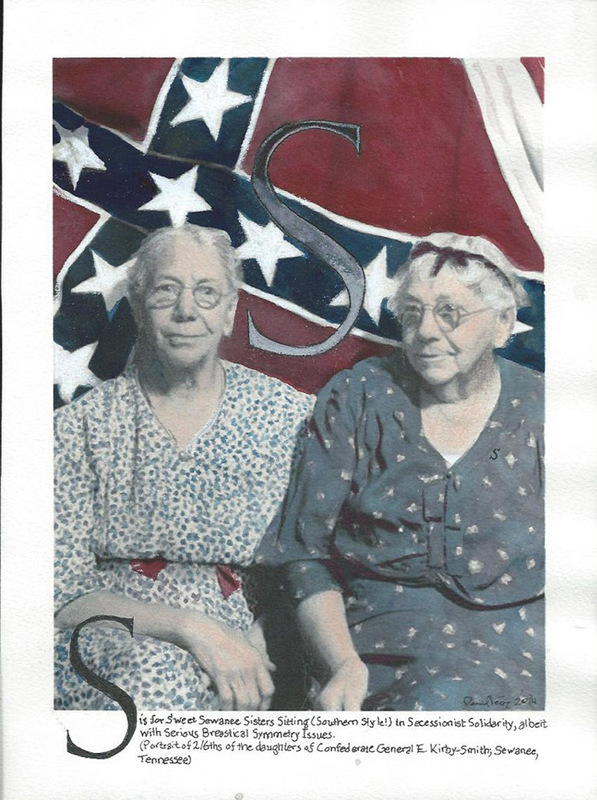 So?….Here’s “S is for Sweet Southern Sewanee Sisters’ Solidarity!”. It’s to be part of the Southern “Alphabet Book” I’ve been more or less doing for about two years. The text can be read at the bottom of the picture. The two ladies are, indeed, the daughters of Confederate General E. Kirby-Smith. The comment about “symmetry issues” came from my awfully-smart friend, Lisa Urquhart, when she first saw the original photograph of Les Souers Kirby-Smith. For one reason or another, I’ve never spent a lot of my time assessing womens’ breasts,so I hadn’t previously noticed the symmetry issue. Lisa is, though, RIGHT…..a smart lady, as I said.